We are thrilled to once again be featuring small businesses in what has become our annual Twelve Days of Giveaways! My passion is being able to do what I love (teaching and writing while staying home with my kids) via my own small business (this blog)! 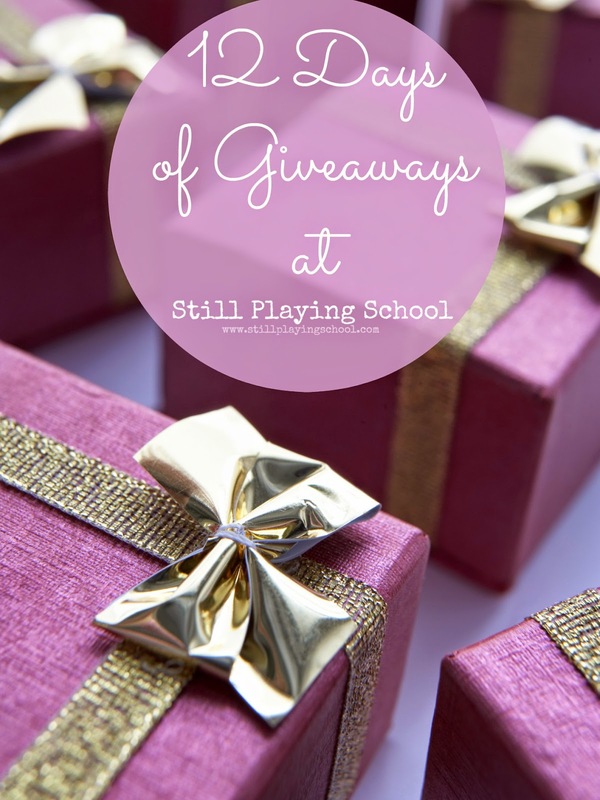 To celebrate you, our readers who keep us going by reading and interacting via our social media we are presenting 12 Days of Giveaways on Still Playing School's Facebook page! From Friday, November 28 through Tuesday, December 9th we will feature a different small business each day and host a giveaway for their products and services! This means amazing prizes for you and exposure and advertising for them. All year long I love to do our shopping, including purchasing gifts, via small family run businesses. In the list of our participating 12 Days of Giveaways small businesses below, these ladies share why they love what they do as well as what goods and services they offer. Consider everyone on your holiday shopping list including teachers, parents, grandparents, children, and even yourself as you visit their shops to round out your holiday shopping in the comfort of your own home! Several of the businesses below are offering sales exclusively for Still Playing School readers so when you LIKE them on Facebook please leave them a note telling them that we sent you! The Flash Giveaways on our Facebook page will be random and not in the order below! Make sure you like and Get Notifications from our page so you don't miss a single chance to win over the next twelve days! I'm also keeping exactly what they are offering as a prize wrapped up as a secret for now! Adrienne Mohn, LMT, is my personal massage therapist whom I highly recommend my local friends and readers! She offers massage and other bodywork spa services at Brownstone Station Massage and Bodywork located in Hummelstown, PA. She also creates organic skin and bodycare products handmade to order though Adrienne's Herbals including Aches and Pains Salve, Citrus Jasmine Perfume Body Oil Blend, and Cocoa Bean Chocolate Facial Toning Oil, just to name a few! In addition to the prizes (Yes, plural! Adrienne is giving away two prizes in our giveaway on the same day. One is for local winners only and one is for a US resident!) Adrienne is offering Still Playing School readers a special sale on gift certificates for The Massage Sampler Deluxe with Herbal Facial Treatment. This treatment has a $190 retail value but you can purchase this exact special service online for a 48% discount for $99 using our link above! Adrienne also promotes the Think World Peace page created by Alan Jordan which will be hosting an extra special and generous surprise in our 12 Days of Giveaways! Essentially Invigorated is run by Eve Rosno who is a dōTERRA Wellness Advocate, a wife, and a mama to three children ages 5, 3, and 1 with her fourth child due in May. As her parenting journey unfolded, she quickly became convinced that she wanted to help her family stay healthy using as many natural means as possible. She says, "We have been so blessed by dōTERRA essential oils and I couldn’t help but share them with the world! Our family uses them daily for everything from tummy aches to fevers to sore muscles to the endless bumps and bruises." You can start your dōTERRA journey with Eve in several different ways! 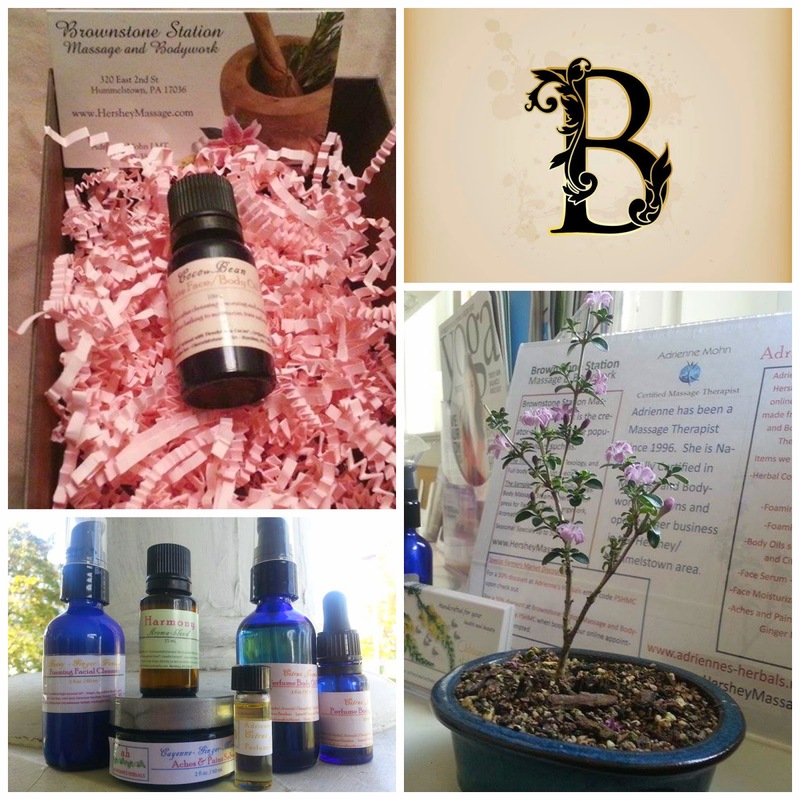 You can buy retail through her website, you can attend free classes offered through Facebook, or you can enroll as a wholesale member with a starter kit to receive 25% off all of your purchases for the next year. In addition, Eve is offering a special to all Still Playing School readers who enroll before the 12 Days of Giveaways are over. All who enroll with a wholesale membership will receive a complimentary copy of the new 6th Edition of the Modern Essentials book which retails for over $25. It is the text book for essential oils! 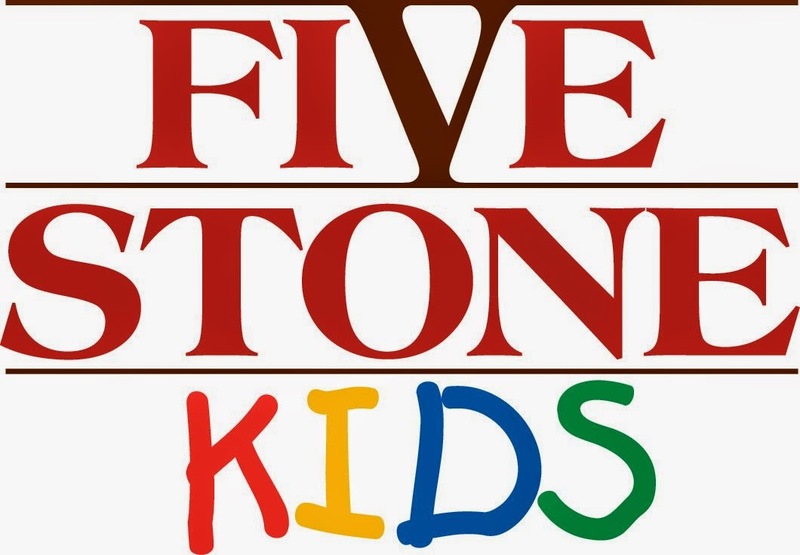 Five Stone Kids is our favorite local hangout where the kids can play indoors when we have cabin fever during our long, cold winters! Our kids have two December birthdays so we book their birthday parties there, too. The best part about Five Stone Kids is that the front of the store is a book and toy store where we frequently pick up gifts for our own kids and their friends. On Small Business Saturday, Five Stone Kids is offering 20% off almost all retail items in the store! (Some exclusions apply.) Lots of families are asking for gifts of time for their children this year! If you need a great idea for a child on your shopping list, purchase monthly passes or gift certificates for a day to create memories and support a local small business this holiday season. 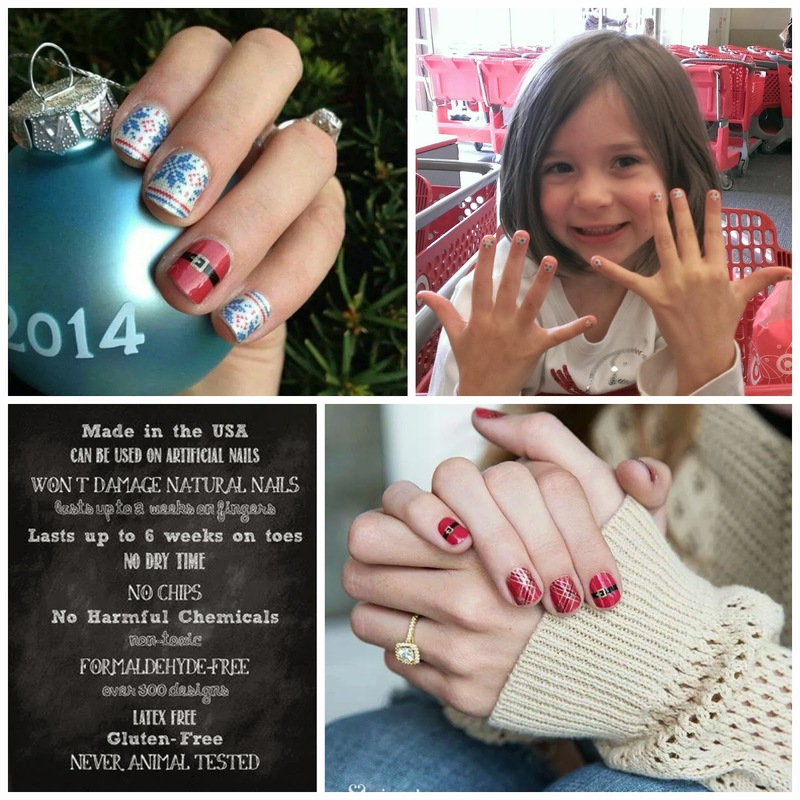 Destiny sells Jamberry nail wraps which E and I both love! They are non-toxic and last up to 2 weeks on your fingers and 6 weeks on your toes. With a little heat they can be applied to real or artificial nails. There are over 300 styles but the smaller Junior Collection is the perfect size for our preschooler so they are at the top of her list this year! Grab these for stocking stuffers, put them in a Christmas card for your niece or BFF, and host a party in 2015 to earn free wraps while your friends shop! 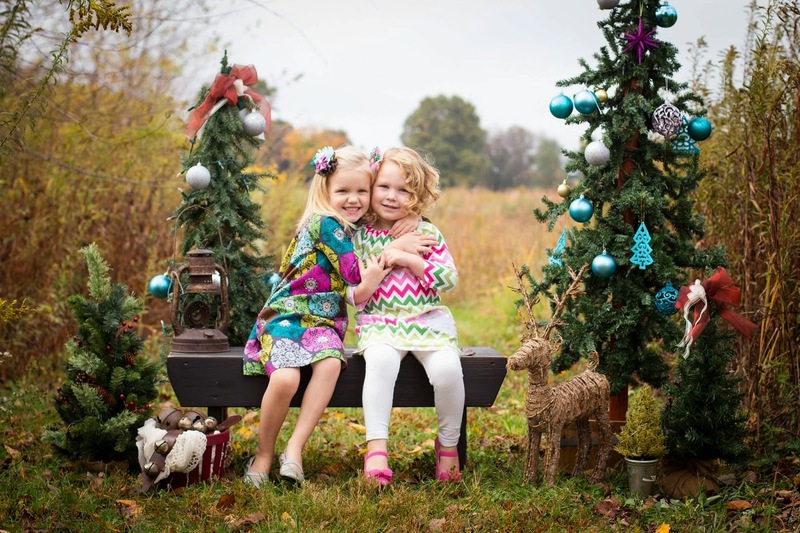 Little Pink Peony is the go to handmade etsy shop for adorable girls' clothing! Danielle says, "I love to sew and create fun, colorful, cute outfits for little girls that are comfortable enough for a day of play and allow them to still be kids!" Little Pink Peony is offering a coupon code exclusively for our readers! You will receive 10% off with the code SPS12DAYS through Christmas 2014! In addition, if you are a local shopper, Danielle is willing to meet for pick up items if you'd like to save shipping. 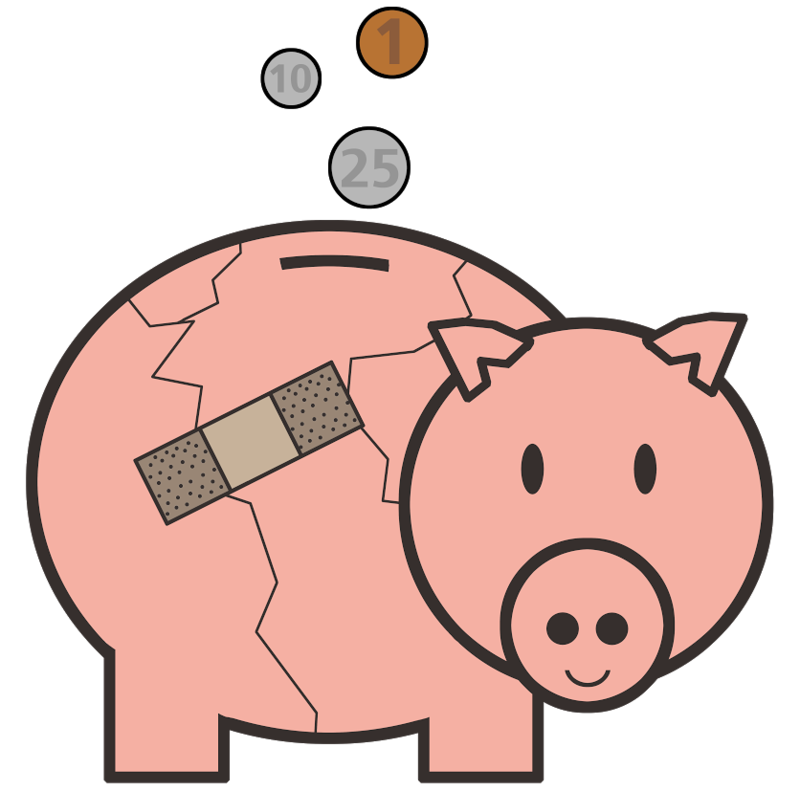 Mending the Piggy Bank is a fellow Central PA blog that I've had the opportunity to get to know (and read) lately! Brianna is the author and newly minted stay-at-home-mom to two crazy boys ages 2 and 6. She shares her frugal living tips, fun activities in the area, hot deals, product reviews and delicious recipes on her growing blog. The self-described thrifty mama extraordinaire stockpiles name-brand diapers for $2 a package, cooks amazing meals on a $50 per week budget for her family of 4 and couponed long before it was considered a verb. I'm excited to reveal what giveaway she is bringing to our series! To get all of her hot tips on savings and deals, follow her on Twitter, Instagram, and Pinterest. 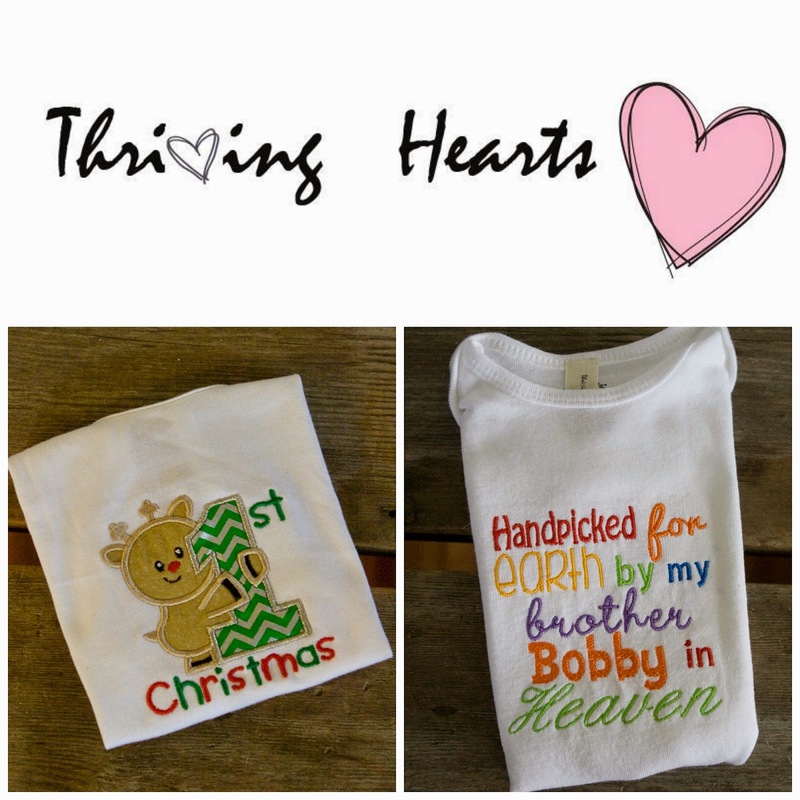 Thriving Hearts creates cute and custom made embroidered clothing and accessories. Bettina explains how a broken heart became a Thriving Heart, "My adventure as an Etsy store owner began when my middle son died in 2011 from a congenital heart defect at only ten weeks old. I've never experienced such a grief before. I needed something to occupy my mind and body. I've always loved sewing but hadn't done it in years. I decided that I wanted to do it again. I bought an embroidery machine a few months after my sons death. I loved every minute of it when I would sit down in front of my machine. That's when I decided to start my Etsy store - Thriving Hearts. I love what I do and I love when I hear back from customers and even sometimes with a picture of their child wearing a Thriving Heart shirt. Knowing that they truly love and appreciate what I do is just the icing on the cake. Having this business also allows me to only work part time at my "regular" job and by doing so I get to be home with my kids and just being there for them." Wow, isn't her story exactly why we all love, support, and shop small businesses this Christmas? 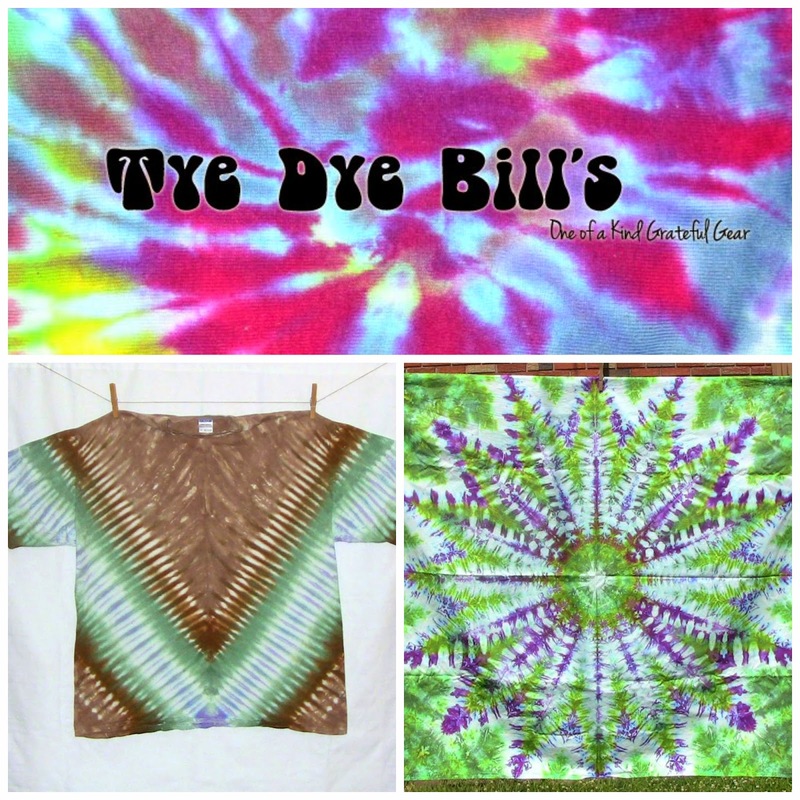 Tye Dye Bills was created by Amanda Johnson. Amanda hand makes most of the tie dyes, tapestries and bed sheet sets (nature inspired are her favorite) and the portrait drawings, as well as other grateful gear. Her team consists of her husband who occasionally makes tie dyes (very groovy style), rinses her bins and is sole owner of their shop name (a name given to him during his on the road days), and her children who are the reason she creates and sells on Etsy. Amanda says, "We love sharing our art, love and soul with others. Each item contains a moment of our lives, a piece of our hearts, part of our souls. When you purchase our creations, you are buying moments of frustration and days, weeks, years of pure joy. You are not just buying things, but rather more time for us to make things we are passionate about." 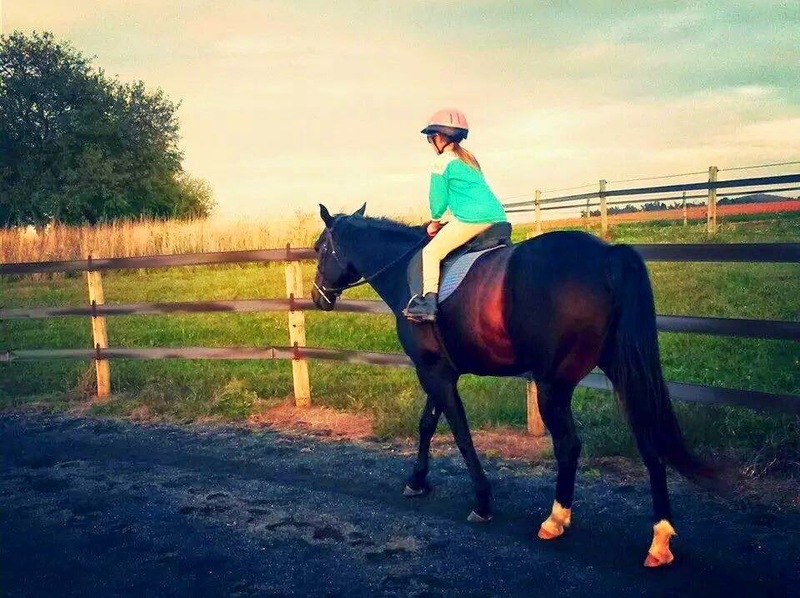 SouthEast Stables is a small family owned lesson and boarding barn. Andrea teaches English and western, private or group lessons for age 4 and up. This includes adult lessons, too! She's been teaching for over 8 years and loves being able to share her love of horses! SouthEast Stables is currently running a sale for our readers which is 4 lessons for the price of 3 ($75 for $100 worth), if paid for by December 15th. 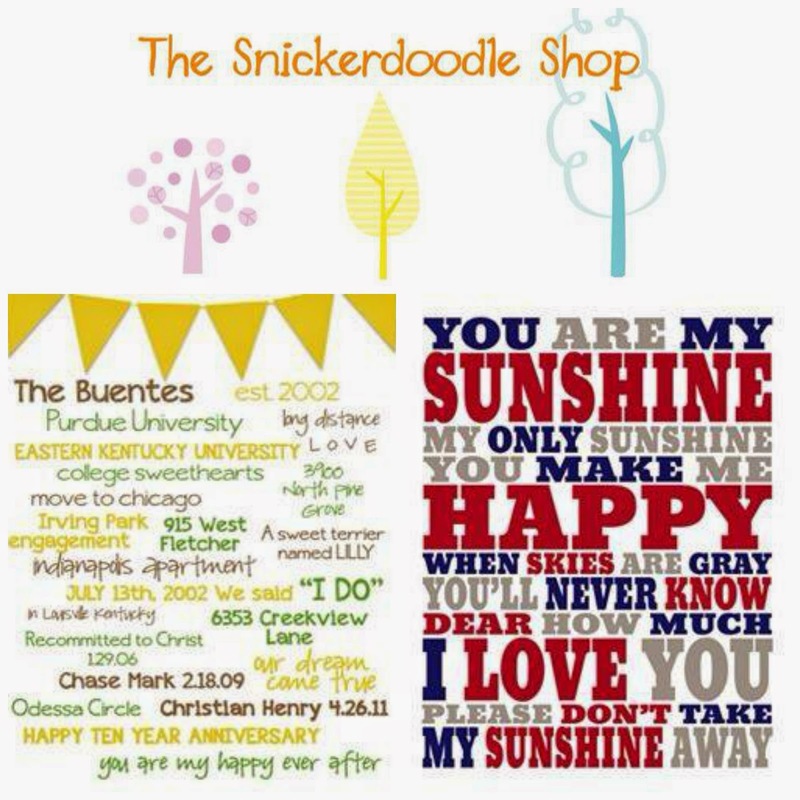 The Snickerdoodle Shop offers custom birthday and party banners, hand painted wall letters, and unique subway art! They love the creative outlet it provides! Custom made subway art can be any size, color, and phrase. You choose from a birthday chalkboard sign, favorite song lyric, scripture, "the story of us," or another idea so the possibilities are endless! Stitch Craft is run by Amber who is a stay at home momma of two. 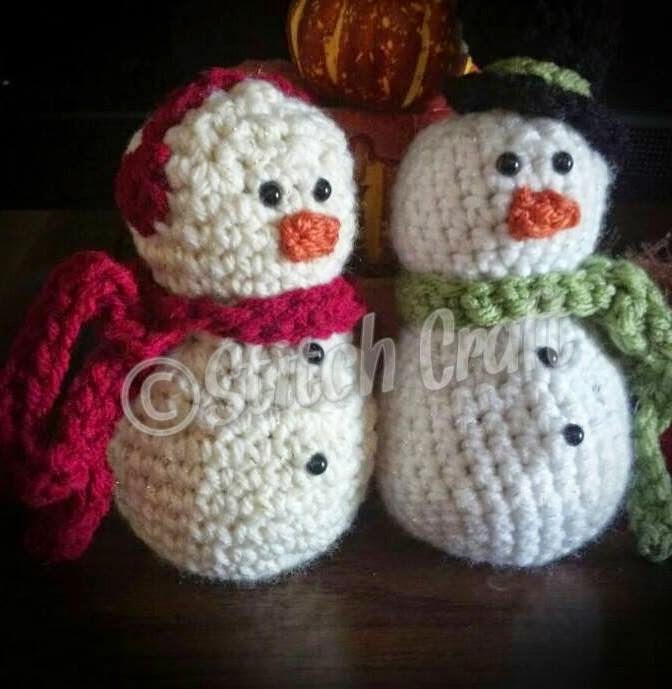 Her mother-in-law taught her how to crochet when she was pregnant with my daughter 8 years ago so she had something to do to pass the time. Amber says, "I'm thankful for this wonderful gift because it makes so many people happy with gifts that last a life time. I love what I do, and couldn't think of my life without this craft. Not only can I create things, but I have those special memories and this special talent all because of my Mother In Law. My FAVORITE items to make are hats. It's so fun to be able to make a sketch come to life and turn that strand of yarn into something amazing!" Blayne who writes at one of our favorite blogs, House of Burke, is now an Usborne consultant as well! Usborne's children's books and products are quality. Usborne offers so many amazing books for babies to teens at affordable prices. With over 1800 products and new releases all the time, there is something for every child! Blayne says, "I love everything Usborne! Signing on to become a consultant was such an awesome career choice for me. As a stay at home mom to two little boys, an infant and a toddler, I needed something that I could work around my busy schedule. 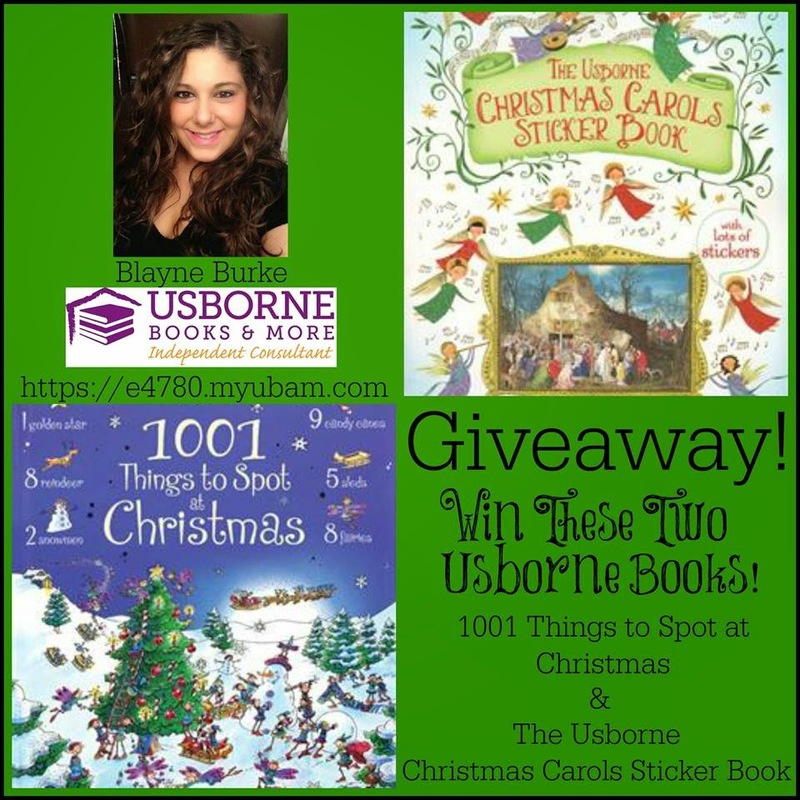 With Usborne, I am able to work as much or as little as I want. The best thing is that I am selling the best books in the world! One of my favorite aspects of being an Usborne consultant is throwing Facebook parties! Interested in getting FREE books for your kids? A Facebook party is such an awesome, low maintenance option. You don't even have to leave your couch, let alone clean! Ask me how to host one. It is so simple! Another thing I love about this business, is being able to share the opportunity with others. Becoming a consultant is so simple and the benefits are phenomenal! You can find out more information here." Follow House of Burke on Facebook, Twitter, Pinterest, and Instagram. I'd like to extend a big thank you to our twelve small businesses for participating! As you do your holiday shopping, please consider these talented ladies' who love what they do to keep small businesses thriving and strong. Don't forget to check back to Still Playing School's Facebook page every day for our 12 Days of Giveaways! Visit Still Playing School's profile on Pinterest. Yay! I can't wait to see all the prizes!